Numismatics is the study of coins. I study ancient coins as a hobby. [new] A Gift for Polydektes, my coin blog. Frequently updated. Black Sea Hoard photos from Best Of The Celator 1989 and web images. Cast Greek silver from Parion and Histiaia. Synopsis de Mille Coins Faux du Faussaire C. Christodoulos by Svoronos (AKA Christodoulos the Counterfeiter). List of old coin book reprints sold by Elibron.com. Free eBooks of the Numismatic Chronicle from the Million Book Project and web access from Google Print. 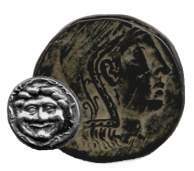 Ancient Coin Collectors Guild (ACCG), Numismatic Bibliomania Society (NBS), American Numismatic Society (ANS), Bronx Coin Club (no website; meets monthly in midtown Manhattan). Search ANS collection and library, Wildwinds.com, ISEGRIM Project, Sylloge Nummorum Graecorum [British Series], CoinArchives.com. Back up to home page.